This is a printable coupon found at HealthyEssentials.ca’s website. Visit their site, create an account and sign in. Select the Neutrogena coupon to order and click on the ‘Print’ button. You will be prompted to download their coupon printing software. After you print the Neutrogena coupon you can bring it into any major retailer and save money. Most retailers accept printed coupons such as Loblaws, Walmart, Metro, Shoppers Drugmart and more. Neutrogena coupon is to save $10 when you purchase any Neutrogena Rapid Wrinkle RepairTM or Rapid Tone Repair product. 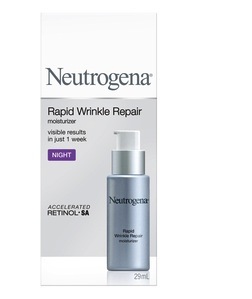 Neutrogena® Rapid Wrinkle Repair™ Serum instantly smoothes skin and delivers visible results in just one week! By combining a unique combination of Retinol SA, Glucose Complex, and Hyaluronic Acid, the lightweight, silky serum moisturizes and renews the look of skin throughout the day, and helps to reduce fine fines and wrinkles and diminish the look of age spots. Skin is left feeling smooth and looking younger.